Speed, reliability, operability, and versatility are key concerns in any video production. 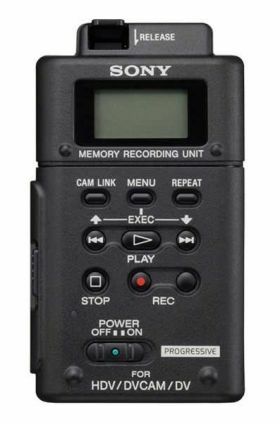 The HVR-MRC1K Memory Recording Unit from Sony offers stunning innovations for all aspects of the production process - from acquisition to editing, and on to material archiving. The HVR-MRC1K consists of the HVR-MRC1 main unit, HVRA-CR1 cradle, cold-shoe adaptor and an i.LINK cable. 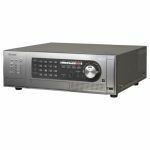 Extremely compact and lightweight, the HVR-MRC1K can be mounted on a HDV™/DVCAM™ camcorder, thereby?converting it to a 'hybrid' recording system with CompactFlash® solid-state memory and tape. 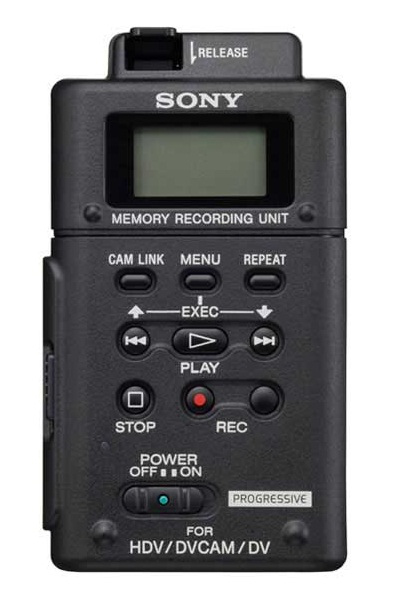 It allows the user to record video on a tape and CompactFlash (CF) card simultaneously. This product comes with the full PrimeSupport package. That’s fast, hassle-free repairs, a helpline offering expert technical advice, and a free loan unit while yours is repaired. Plus the peace of mind that Sony is looking after your equipment – and your business. Windows 2000 Professional SP4, XP Home Edition SP2, XP Professional SP2, Windows Vista,\nMac OS X (v10.3).